Peterborough United chairman Darragh MacAnthony has declared an interest in investing in troubled National League club Dagenham & Redbridge. ‘The Daggers’ have hit financial troubles following the recent resignation from the board of their majority shareholder and MacAnthony was approached by a fan of the non-league club on social media last night (February 19) for help. Dagenham & Redbridge manager John Still. MacAnthony had been unaware of the club’s plight, but immediately showed an interest in getting involved. Football League rules allow him to have a stake in an another club outside of the Football League. MacAnthony tweeted: “Great club with such pedigree for lower league talent recruitment. (I’d) be happy to take a look at it (helping). “I think I could be a majority shareholder until Dagenham win promotion to the Football League then I’d hand it to someone trustworthy for them to operate. Just an idea obviously, but it would be good for Posh and for them. Former Posh manager Still is the Dagenham & Redbridge manager. Posh signed star strikers Craig Mackail-Smith and Dwight Gayle from Dagenham and Redbridge. MacAnthony issued further backing to Posh boss Grant McCann over the weekend, but he revealed last night he expects a top six finish for his £1.4 million outlay on players since last summer. 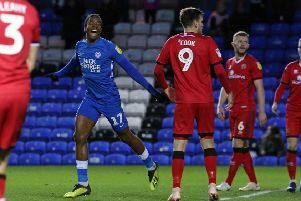 He disclosed loan signing Omar Bogle’s wages would cost Posh £100,000 for the rest of this season. MacAnthony also stated he had spent £450,000 on Jack Marriott, £350,000 on George Cooper, £100,000 on Joe Ward and £50,000 on Alex Penny as well as ‘big money’ on Steven Taylor’s wages and ‘decent money’ on Michael Doughty’s wages. Goalkeeper Jonathan Bond’s loan fee/wages were also considerable and Marcus Maddison was handed an improved contract in August.